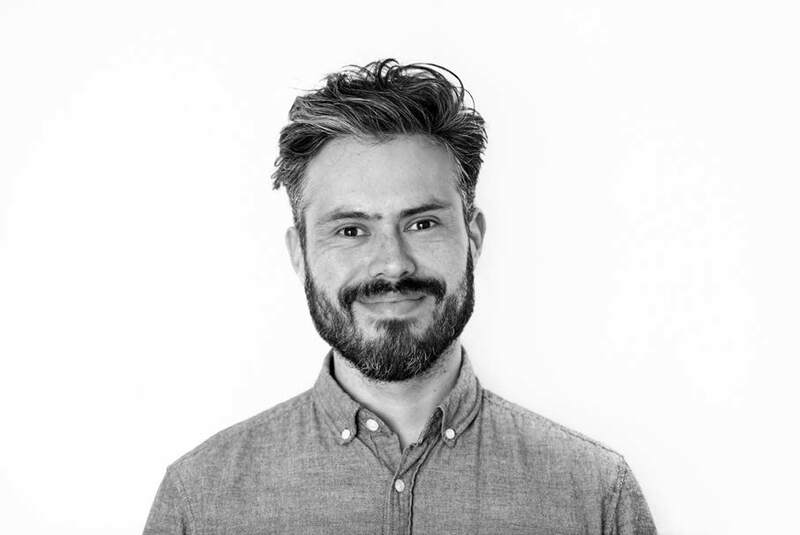 Hi, I am Andrés Gallardo and this month I will have been in Barcelona for a year and a half. Before coming here I lived in Bilbao for six months, there was where my adventure in Spain started. Throughout my stay in Catalonia, living downtown, I was able to confirm that Barcelona is a city open to receiving new ideas from entrepreneurs wherever they come from. This city does not harbour trends, but rather creates them, becoming an ideal space for inspiration and to soak in the multiculturalism that lives on its streets. During my stay in Barcelona, I studied a master degree at Elisava, which brought me many tools to make mine the place where I’m living. When I enrolled in the master degree, I learned that collaborative work is the key to make new creative projects in different contexts, where you can get feedback from many other perspectives, which is further enriched by the professional and personal backgrounds of those studying with you. With the mentoring of Manuela Procopio, I am researching the trends in the establishing of communication flows in collaborative spaces, and creating a model that allows for the replication of this interaction wherever needed, be it Chile, my homeland, or Barcelona. This Project has been awarded and financed by the Fondo Nacional de la Cultura y las Artes Fondart which belongs to Consejo Nacional de la Cultura y las Artes of the Chilean government. The results of this investigation will be exposed through public seminars at the Istituto Europeo di Design in Barcelona, Universidad de Chile and Universidad Católica de Chile. I’ve aligned all my ideas and created a project around co working spaces and fab labs in Barcelona to understand their work dynamic and what is the existing system of communication in place, among other things that will arise throughout the project’s development. I must mention that there’s an assumption given to these places, which is that any and each person belonging to them can give immediate feedback, discuss important aspects of their projects, and validate their ideas with people from different backgrounds. Therefore, I asked myself what kind of trends exist that produce these interactions between coworkers or which patterns or forces of change can be foreseen in future working spaces. Consequently, I organized an investigation entitled Creative Spaces and New trends of Communication; Residency at the Istituto Europeo di Design in Barcelona. 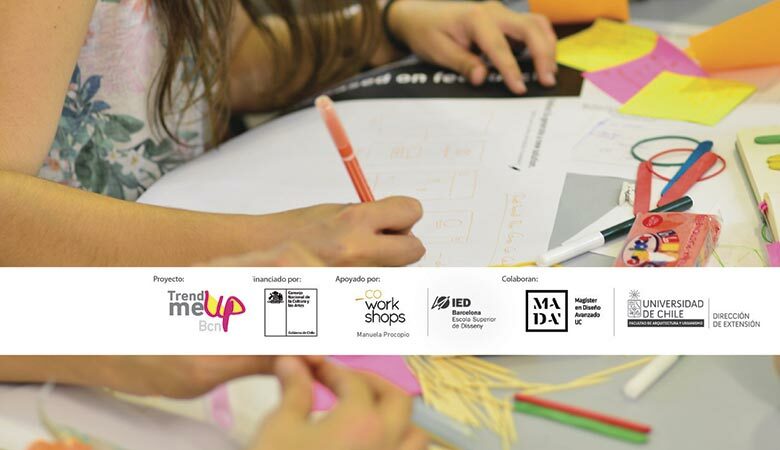 For this purpose, I will work alongside Manuela Procopio, trends and design researcher, who will be my mentor on trends identification in Barcelona and collaborative work, her being a local and global referent in these types of dynamics. In order to make this investigation it is necessary to understand what are the important pieces that make these spaces work, such as, professional profiles, complementary team roles, and to understand why it’s necessary to build multidisciplinary teams, and these dynamics, so as avoid these places from becoming simple spaces with chairs and work tables. While I was living in Bilbao I developed a project I entitled Escaleno which was inspired in the quartz fields of Bizkaia, hence the name, because an asymmetric aesthetic is more organic. 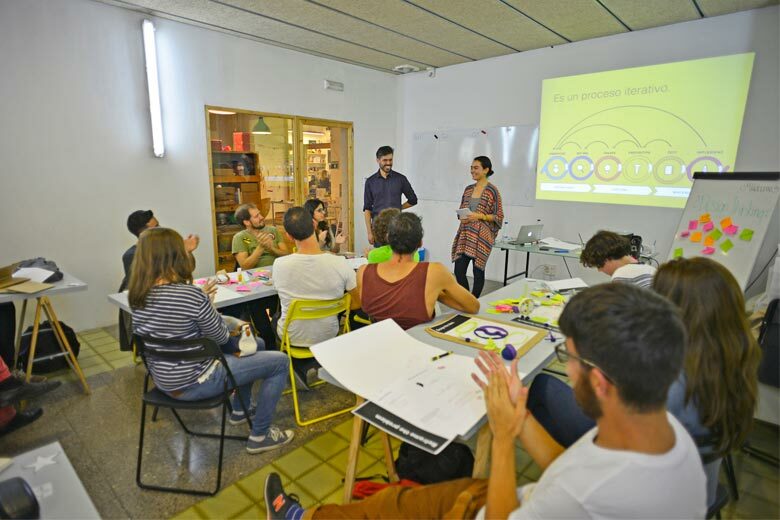 Once in Barcelona, I continued working on the project, but from another point of view, to do this, I started giving workshops in different places around the city, such as Fabcafe Barcelona. 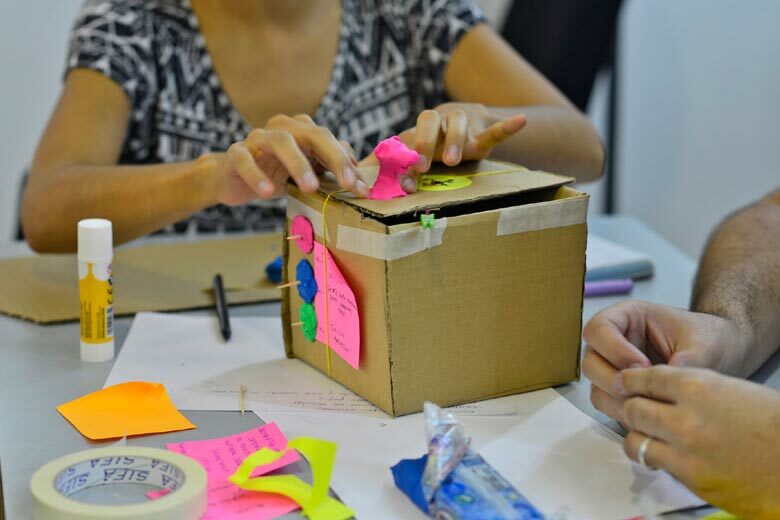 These workshops were about Design Thinking. The purpose of these activities was to learn about the methodology, as well as to create empathy and collaborate work, in order to find out which real needs they have (like consumers or product clients or live a service or an experience), in addition, a possible redesigning of the ceramic pieces. After this experience in Barcelona and Bilbao with Escaleno, something changed in my own praxis. Currently, my intention as an industrial designer and design thinker/coolhunter is not only to elucidate what kind of things I have to re design in my ceramic pieces and thus innovate but to go further, and move beyond author design, and create a product born of collaborative work, and provide social innovation. That’s my focus, my strong potential and what makes me stand out. On the other hand, I’m working along with other creative people. Together we’ve developed collaborative projects, where we’ve used insights from the Design Thinking workshops I’ve imparted. These insights are in formal features, such as portability, assembling things, and symmetrical aesthetic, but keep the main feature of Escaleno. These requirements have been extrapolated to objects of daily use or markedly seasonal use, such as plant pots, and of course the usual Escaleno coffee cups, with a new design of their plates for the assemblable set, amongst others. 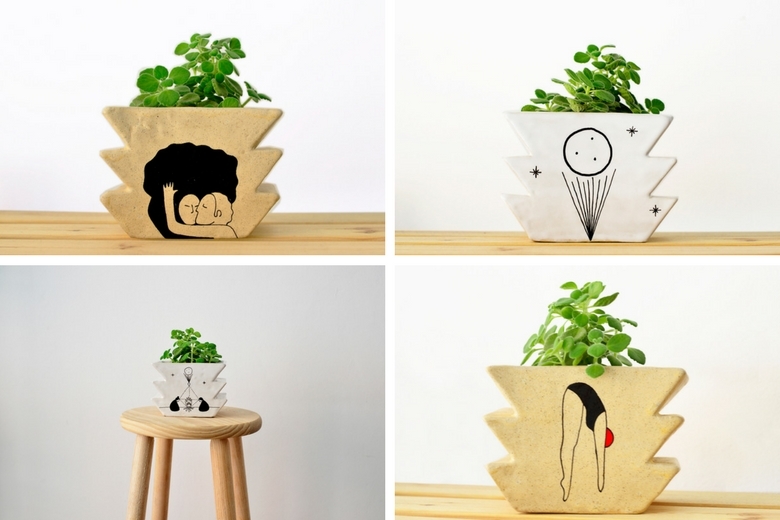 In this context, I´ve created a new plant pot along with artists such as Iris Ilustración, who with her strong stroke wishes to tell us the daily lives of regular people, that hold nonetheless a universal transcendence. The collaboration’s role is to tell us stories people will find themselves reflected on, wishing to establish links to the object that goes beyond the simple functionality. For this, we’ve changed the platform in which the story is told: we went from a canvas to a tridimensional figure in ceramic, which by itself is already a story, and through illustration, we can begin to complement and create another world. Furthermore, I am also working along with HierbaBuena team, whose goal is to reforest the planet step by step. 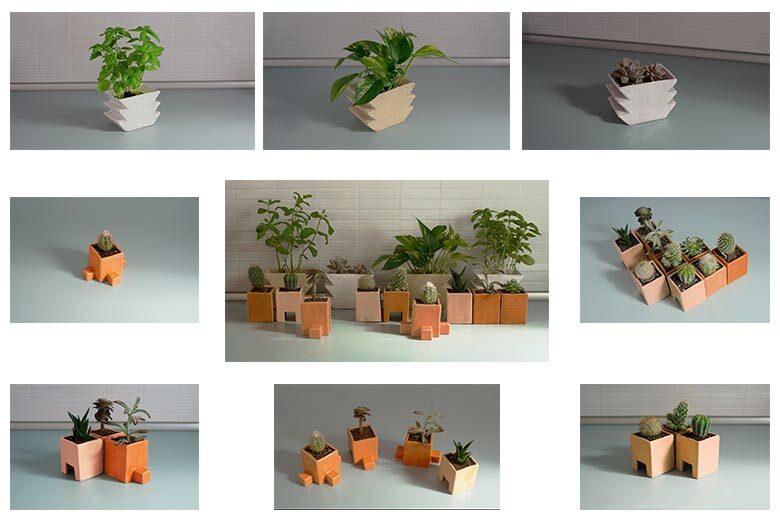 In this case, we’ve created modular ceramic pieces, particularly plant pots which can be linked to each other and create communities of cacti, based on Italian landscapes, and trying to emulate building blocks, which stand right next to each other, emulating their color palettes and terraces, like the ones we can find in Naples or Barcelona. Our idea is to appeal to local identity by considering different expressive and formal elements. Also, while I was enrolled in the master degree at Elisava (Master in Research for Design and Innovation) and was getting to know Barcelona’s city dynamics, there was a field trip to Lisbon where I could go around to many collaborative spaces with huge potential for development. Afterwards, I researched the meaning of collaborative spaces, or better known as co working spaces, and I realized that in Chile it basically doesn’t exist when compared to Europe, where there are around 2500 spaces. Recounting the experiences I had in Barcelona on the topics that I mentioned before, I must add investigations I’ve had to undertake according to my studies in Design Thinking and Coolhunting while studying for the Master’s degree and then afterwards when I was hired as an intern for the innovation studio Inedit Innova. In both cases, I was able to understand the value of collaborative work in the value chain and how important it is for local development. On the other hand, encounters between creators are on the rise, and it’s the trend that’s set by spaces such as Fab Labs, Co Working spaces, and agencies. Discover the latest fashion trends with WGSN! Lifelong Learning: We practice what we preach!